In a motorcycle market where competition is more heated than ever, brand loyalty is the Holy Grail. And perhaps no group has been more unwavering in its brand loyalty than American law enforcement. Since Harley-Davidson delivered its first police motorcycle to the Detroit Police Department in 1908, Harley has been a fixture among the nation’s police force—helping officers arrive at the scene quickly, maneuver with ease and go where four wheels simply won’t allow. But now, as the CHiPS era fades from our memory, a new kid on the block is changing the police motorcycle game. Enter Zero. If there’s any indication that electric motorcycles are gaining mainstream appeal, look no further than police departments, which are embracing Zero bikes in record numbers. Since the first motorcycle police unit was launched in Berkeley, California in 1911, motorcycles have been a fixture for forces across America. Harley-Davidson plays an undeniable leading role in that long history. It shipped 20,000 bikes overseas during World War I to help soldiers dispatch wartime messages faster. When the war ended, a surplus in motorcycles made their wider adoption on police forces a no-brainer. By the 1920s, more than 3,000 police departments were using Harleys. Fast-forward to 2019, and police departments still swear by motorcycles to help them go where cars can’t, accelerate more powerfully than four-wheeled vehicles and weave through traffic with ease. Although a lack of storage can make them unsuitable for certain tasks and hours of riding can bring the inevitable discomfort, motorcycles are being used for much more than traffic stops and parade details. Nearly 80% of today’s police motorcycles are Harleys. But as the needs of the modern police force change, so has its ride of choice. 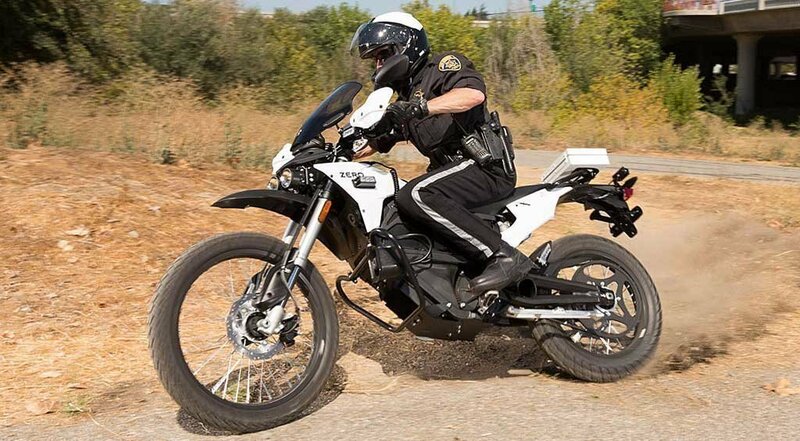 More than 100 law enforcement agencies have begun using Zero electric motorcycles, and signs show the trend isn’t slowing down any time soon. Why Zero? As one officer explains, the fuel-free bike lets officers accomplish things that traditional gas cruisers don’t. The Zero model used by the Clovis PD, the Zero DSP, can handle on- and off-road terrain with ease, is exhaust-free and needs virtually no maintenance. An added bonus? Its whisper-quiet system lets officers sneak up on suspects a lot more efficiently than the rumbling models of the past. Three years since tackling the police market with force, the Santa Cruz-based Zero is adding about two new law enforcement agencies per month. It’s now becoming the more agile ride of choice for units in both the United States and our neighbor to the north, Canada. Still, the electric motorcycle has its drawbacks. A 90 mph highway chase, for example, will run down the Zero DSRP battery in just 60 miles. That’s just one reason why the Michigan State Police Precision Driving Unit told Fast Company that its highway patrols will stick with their current rides. The result is that rather than replace Harleys on a force, the Zero is finding a niche as another tool—one that falls somewhere between a Harley and a bicycle. In the exceedingly crowded electric motorcycle landscape, Zero is an undeniable leader. Although niche—the brand only sells between 2,000 and 10,000 bikes per year internationally, compared to Harley’s 168,240 in the U.S. alone—Zero has maintained an impressive 40% YOY growth rate. That matches the overall forecasted growth for the electric motorcycle space, which one leading market research firm puts at around 41% by 2021. Zero’s extensive 2019 lineup demonstrates that it’s continuing to invest big in the electric motorcycle space. The Zero S and DS models are getting a 35% power boost and a top speed increase of 8%. But while Zero is building on its initial success, other motorcycle companies are snapping at its heels—including Harley itself. Harley-Davidson’s LiveWire, coming with the promise that “the loudest sound you hear will be your heart racing,” launches this year. Brutus is now offering a law enforcement option of its full-size Brutus V9 bike. And in the dirt bike arena, Swedish brand Cake is marketing an electric bike about half as heavy as a typical motocross bike, with a 15kW motor, a 52-volt battery and three “power modes” aimed to satisfy beginners and experienced riders alike. It’s yet to be seen what technologies motorcycle brands like Yamaha and BMW showcase at the annual Consumer Electronics Show next week. But one thing is for sure: in an increasingly techie motorcycle landscape, electric motorcycles are developing a niche all their own.